You are here: Home / Ethnic Groups / The People of Java / Who are the Banten? When Indonesians hear “Banten”, they often think of the mystical arts. The Banten are basically Sunda who have had a different identity since the time of the establishment of the Banten Kingdom, which broke off from the Padjajaran Kingdom of West Java. The Banten live in Banten Province in the southwest of the island of Java. Currently, most Banten live in the regencies of Pandeglang, Serang, Lebak, and western Tangerang, as well as the cities of Cilegon and Serang. The Banten speak a dialect of the Sunda language. This dialect is regarded as less polite and less sophisticated compared to the dialect spoken by Sunda living in West Java. The Banten grow rice and other crops such as coffee, cloves, beans, bananas, and durian (a stinky fruit with a thick, spiky shell). Cooperative groups work the land. One type of group is the royongan; in the royongan workers are not paid directly. Instead, their wages are pooled and saved by the community elder to be used for the repair of the mosque and Muslim prayer houses. Another form of coooperative work is called liliuran, which is helping one another work the rice field without any expectation of payment. Cooperative work arrangements are also used for repairing roads, bridges, and other public facilities. This cooperative work is required of all. For example, in Tanjung Sari village, a household head who does not participate is assessed a fine. The Banten leadership is composed of three elements: formal leaders (umaroh), Muslim leaders (ulama), and tradition and cultural leaders (jawara). These three groups play an important role in forming the local political system. The village’s kinship relationships are cultivated and developed by the village leaders, who are very respected and honored. Other village matters are handled by the leaders who take care of matters related to administration, irrigation, logistics, and religion. Ancient Banten is still of great interest, particularly for historians and archaeologists. Banten is one of the famed kingdoms of the past. In the Banten area there are many tourist attractions, beginning with a nature preserve and including the great Mosque of Banten, where the tombs of Banten’s sultans are placed at the south and north of the mosque. Reportedly there is a nine story rock, with a height of 15 meters, that is a relic from the Megalithic Era. As a tourism area, Banten is open to the outside world, but their traditions and culture are still protected. From the 15th century establishment of the Sultanate of Banten until today, the majority of the Banten have been Muslims. They are faithful Muslims, but still practice black magic and occult power. This can be seen in the famous art of Banten known as debus: through the use of certain mantras the body of a practitioner can be made invulnerable to physical blows, fire, and sharp objects. Many people from different regions of Indonesian come to Banten to learn these spells or to ask for help. The Banten are known as people who have great occult knowledge. 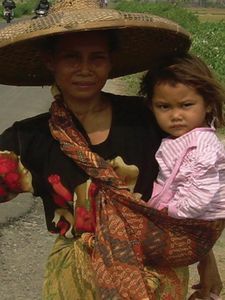 Most Banten make their living as farmers or merchants. In both cases, they need to be prepared to face stiff competition in this modern era. They need better educational facilities, as well as joint business ventures with outside companies to achieve a higher level of competitiveness. Additionally, the Banten living in remote areas such as Panjang Island in Banten Bay need development to overcome poverty.